I bought a pint of fresh raspberries at the Farmer’s Market Saturday and felt inspired to make raspberry oatmeal cookie bars. The recipe below is vegan, gluten free and heart healthy. I adapted it from a recipe on the Vegetarian Times website, but switched the white flour for oat flour and made it vegan. And I reduced the amount of sugar. I also added fresh raspberries. And I made a couple of other changes. Okay, it’s pretty much original. You could make this recipe with blueberries or strawberries too. Try serving with raspberry or chocolate sorbet for an awesome dessert. Would be a welcome part of a brunch menu also. 2. Stir together oat flour, cinnamon and baking soda in large bowl. 3. Whisk sugar and butter substitute until light and fluffy. Add the flaxseed mixture and vanilla and whisk til smooth. 4. Add flour mixture to sugar mixture; mix until combined. Stir in 1 3/4 cups oats. 5. Spread 2/3 of batter on bottom of prepared baking dish. Spread raspberry jam over the batter with back of spoon. Sprinkle raspberries on top. 6. Add remaining 1/4 cup oats and nuts to remaining batter. Crumble evenly over top. 7. Bake 25 minutes. Cool, then cut into bars. December is so busy. Agreed? Hard to believe a couple of weeks have gone by since I last updated this blog! Since Christmas is a few days away, I thought I would post one of my favorite holiday cookie recipes. If you want to give somone special a treat this Halloween, bake a batch of these Pumpkin cookies. Made with white whole wheat flour instead of white flour, and filled with fiber-rich pumpkin, they offer a healthier alternative to many of the empty calorie sweets around. And the warm scent of cinnamon and spices will fill your home while they’re baking. They are sure to delight! 1) Combine all dry ingredients. Set aside. 2) In a medium bowl, cream together the butter, white and brown sugar. Add the pumpkin, egg substitute and vanilla and beat until creamy. 3) Mix the dry ingredients in with the wet ingredients. Drop on cookie sheet by tablespoonfuls and flatten slightly. 4) Bake for 15-20 minutes in 375 degree oven. 6) Mix together glaze ingredients and drizzle glaze on cookies. Makes about 3 dozen. They freeze well. Those spongy cakes marketed at the supermarket as “strawberry shortcakes” taste like dish rags. And why buy them when it’s so easy to whip up a batch of real shortcakes? For this recipe, I use Heart Smart Bisquick. My mom has always cooked with Bisquick, and I use it too for biscuits and pancakes (although I usually mix in either ground flax seed or buckwheat pancake mix to make the recipe healthier). It’s a great shortcut. 1) Slice strawberries and sprinkle 1/2 tsp. of sugar over them. Stir together and set aside. 2) Mix together Bisquick, almond milk, Smart Balance and 2 tbsp. sugar. 3) Drop shortcakes onto ungreased baking sheet. Bake at 425 degrees for 10-12 minutes. 4) Remove from oven. Cut shortcakes in half. 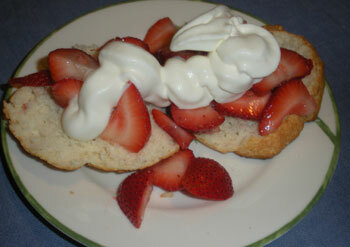 Top with sliced strawberries and with your choice of whipped cream, non-fat vanilla ice cream or vegan ice cream. Makes about 5 shortcakes. To reheat, split cakes in half and toast in toaster oven for a couple of minutes. My friend Lanell is a Vegan who loves animals. She often brings her Chocolate Bourbon Pecan Pie to parties and cookouts. All other desserts on the table pale in comparison to this pie. You just won’t believe how good it is until you try it yourself. 1 pie crust…..I either make my own graham cracker crust or often buy a ready made one. Whole Foods has some without hydrogenated fats. But most pre-made crusts are not the healthiest. 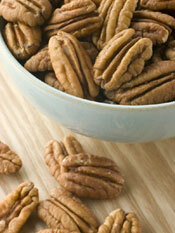 Mix together the first 6 ingredients, then add the pecans and chips and mix together well . Bake for 40-45 minutes at 350. It’s a good time of year to make cookies, and these spicy cookies will fill your kitchen and house with a spicy aroma that just smells like Christmas. They are the perfect cookie to make at this time of the year. Enjoy. A friend from work brought these cookies in over the holidays. I asked for the recipe and have made them a couple of times since (of course, I made the recipe a bit lighter). They are unusual: not too sweet and very spicy.